I am back with another report on the progess of our top juniors! One logistical note: I'm going to skip the Feb 2007 Rating List, as the USCF released the April list in early March. To be fair to the one junior who is now not on the top 10, but was on it in the skipped rating supplement, I will be doing a top 11 format this month. We will go back to focusing on the overall top 10 next month, and return with discussion on the Juniors in May. Hikaru has been ripping apart his competition like a buzzsaw in the past few months and is not only the number one ranked junior, but also the number one ranked player in the country. 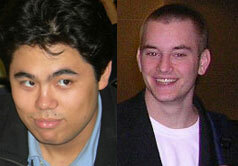 Hikaru surpassed Gata Kamsky by splitting first place at the St. Johns Masters at the Marshall. He defeated Zviad Izoria (2722) and two masters, while being held to a draw by Alex Stripunsky in the final round after "missing a stalemate". So the next time you or one of your student's misses an easy stalemate, don't forget that it happens to the best. Congratulations to Hikaru for becoming the USA's new #1 player. Josh has been playing some serious chess lately, traveling to France to play in Capelle le Grande. Josh had a very solid result with 5/9 but was overshadowed by his friend IM David Pruess, who defeated four Grandmasters and scored a GM norm. Josh is still trying to push towards that 2600 mark. He was up to 2552 after a fine performance in the East Bay International, but he slipped up a bit in the North American Open, losing 8 rating points after a surprising loss to NM Eugene Yanayt (2363). Josh hasn't played a USCF rated event since March, and seems to instead be focusing on high-level European events. Best of luck to Josh in securing his 3rd GM norm. Most of Lev's gains came from his GM norm performance at the East Bay International, discussed in the last recap.School has started up since then, and being the serious student that he is, Lev hasn't played since December. Lev is a fantastically talented young player, but his education and ambition in other fields will probably be a roadblock to true chess greatness. With two GM norms under his belt already, he is almost a sure thing to get the title at some point. One can only hope that Lev will find time to play chess after college and continue to amaze fans with his fresh attacking style. Sal has finally surpassed the 2500 mark with a few fine performances. First he scored 3.5/4 at the February Open at the Marshall Chess Club, a result that included a win over fellow junior Mackenzie Molner (2368) and a draw over the 2700+ rated GM Zviad Izoria. Sal then headed off to the Amateur Team East where he scored a solid 5/6 including a draw with Israeli GM Ronen Har Zvi (2606) and a win over US Chess League All Star, IM Jacek Stopa (2417). Sal is having some nice results but his long-term progress may suffer from a lack of playing in any serious closed/international tournaments. His play is usually limited to large money open Swisses and local events at the Marshall Chess Club. In order to make more progress he will probably need to test himself in some International tournaments where GM norms are up for grabs. Congratulations to John, as after a few bureaucratic hurdles, he finally was awarded the IM title by FIDE. After a fine performance in the UTD Invitational GM norm Round Robin event, in which he scored 6.5/11 and went the entire event without a loss, his rating was up to an all time high of 2479. He then slipped up and lost about 15 points at a tournament that was called "JG's Old Fashioned Hamburgers".Even more strangely, this event was incredibly strong, boasting 5 players rated above 2500 and an average rating of somewhere around 2300. This may be my favorite name for a chess tournament ever, although the Nakamura Open runs a close second. As long as John avoids future Hamburger related events his rating may continue to rise. However I think he has his work cut out for him if he wants to make the top four on this list before his 21st birthday. Robert's rating has bounced up and down the past few months, without much serious action. He has played in 3 tournaments in 3 months, and gone from 2450 to 2447 in those 3 events. The big news for Robert was his performance in the Cannes Open in France, in which he managed to secure his third IM norm after a 6.5/9 performance. Chess can be tough for someone like Robert, for whom the IM title has always been a forgone conclusion. While some players would be able to celebrate such an accomplishment, everyone has expected this out of Robert. Until he becomes a GM his fans won't be fully satisfied. Alex remains in a slump that has lasted for about 2 years, ever since he surprised everyone by winning the World Youth Championship. His rating is expected to drop 12 more rating points after a 5/6 performance at the NY State High School Championship. While 5/6 may sound good, realize that Alex was rated over 200 points higher than anyone and his loss came to a player who was rated just 2000. It's always a bad sign when someone is rated lower at 17 than they were at 15. However Alex does have a tremendous amount of natural talent. He will need to find a way to recapture the passion that led him to the World Youth Championship if he wants to eventually earn the GM title. Daniel wasn't even listed on the Top 100 list in December, and I'm not sure why he was omitted, perhaps his membership expired? In any case he is now in the top 10 where he belongs. Daniel is an interesting case. Comments made by me have been circulating in print about how talented Daniel is and how it's a "joke" that he isn't rated over 2400. While this may seem like high praise, in reality it's only half praise. I believe that Daniel has some psychological roadblocks that have been preventing him from reaching his true potential. Perhaps the biggest problem is that he seems to get really down on himself when he loses and lacks some confidence that he should have. His other "problem" may be his strong interest in other fields such as Cross Country. Also Daniel won the US Masters in March but for some mysterious reason he didn't pay the relatively small $75 qualification fee for the US Championships. I don't have the story behind this, but it seemed insane to me at the time, as I'm quite sure he would love to compete in the US Championship. In any case Daniel has gone from 2250 to 2400 in 2 years, which is very reasonable progress. It remains to be seen whether he will develop the maturity that's needed for him to realize his full potential. This next year will be crucial, as I believe he needs to stop messing around the 2400 mark and quickly make that push towards 2500+. Igor lost quite a few rating points at the UTD Invitational Round Robin, scoring a dismal 2/11. Igor hasn't really played since then; he even skipped the Old Hambuger Classic, which was played in Dallas, where he attends school at UTD. Joel has played one tournament in the past two months, the Amateur Team West, where he scored 5/6 and gained 8 rating points. I've added a spot this time around because Kazim was due to be featured in the last update, however because the USCF is releasing rating lists so quickly, he has since dropped to 11th place. Kazim is one of the most unique members of the top lists, as he is well known as a bughouse specialist. So if you are a young chess student whose teacher tells you how bad bughouse is for your game, you may want to refer them to this article. Kazim made headlines after a fantastic 2006 World Open in which he went from 2278 to 2348 in a single tournament. What's really shocking about this 70 point rating game is that he lost his first two games. He then rallied to win an incredible six straight games including wins over GMs Gildardo Garcia, Gennady Zaitchik and finally Eugene Perelshteyn. He defeated his first ever GM in this tournament and followed it up by beating two more! Since that event Kazim has continued to rise, coming in a solid fourth in the US Junior Closed and winning the 2007 Atlanta City Championship. It remains to be seen whether someone who is a bughouse specialist can keep rising in the standings and perhaps instead be known as a chess specialist who also plays bughouse. Aside from the really young stars like Ray Robson (12) and Marc Arnold (14), whom have already made the top 20, these may be the three mid teenage kids whom are most likely to break into the top 10. Liu, from San Diego, is not only is a strong chessplayer but also plays Defensive Back for his high school football team. He is coached by IM Cyrus Lakdawala. Cheng lives in Atlanta and has seen his rating rise by 150 points in the last two years. The May issue of Chess Life Magazine will feature a U.S. Championship preview by Greg Shahade.